My two plans for childcare did not materialize so I had less than the duration of a birthday party to taste through an untold number of German Rieslings. There was naturally Champagne and as we met up at Q by Peter Chang, a constantly refreshed supply of Sezchuan dishes. There were bags packed with bottles and even one guest brought an entire cooler of wine. I knew I would not taste through everything but I also knew I made the right decision to try. 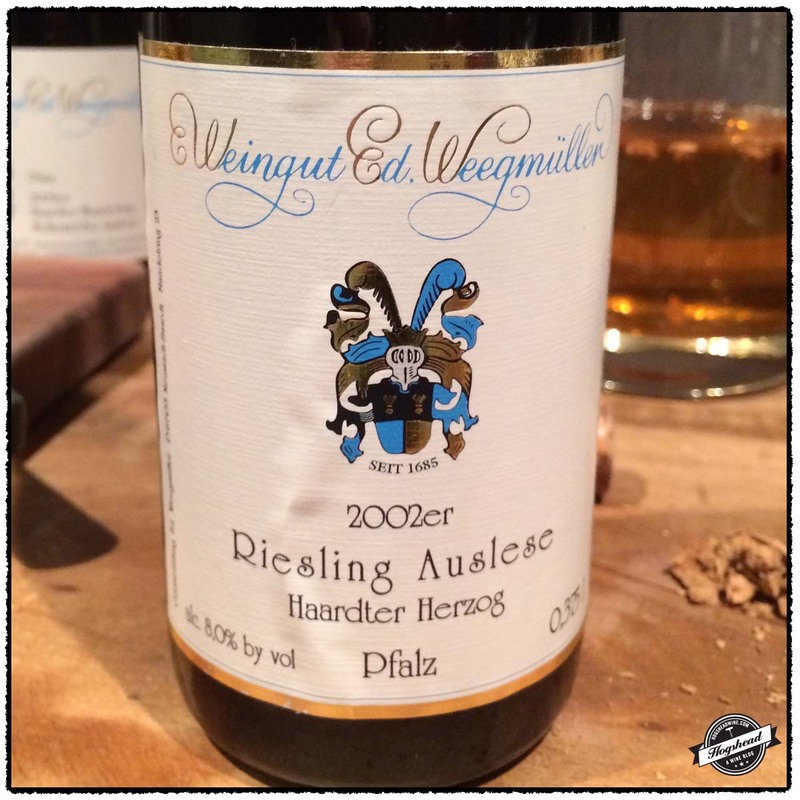 Of the Riesling I managed to taste, there were many solid bottles with just a few duds. Standouts include the 1934 Hermannshof (Weingut Hermann Franz Schmitt), Niersteiner Kehr Riesling Auslese, Rheinhessen which is the oldest wine of the evening. It is in fine shape. Lighter in weight, more floral and a fresher spectrum of flavors than the 1915 Hermannshof, Niersteiner Flaschenhahl Riesling Auslese, Rheinhessen tasted a year ago. An interesting comparison. Both the 2009 A. J. Adam, Dhron Hofberg, Riesling Spätlese, Mosel Saar Ruwer and 2009 Willi Schaefer, Graacher Domprobst Riesling Spätlese #5, Mosel are spot on. 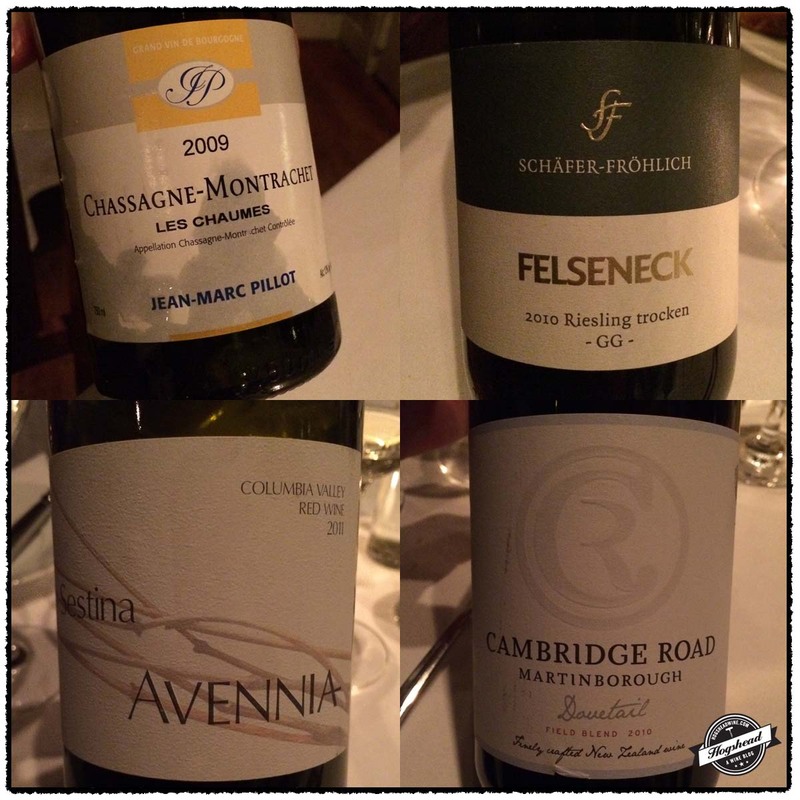 Both have energy from the acidity with the Adam richer and the Schaefer chalkier. You might develop a preference but I love the difference. Exciting wines to taste. Finally, the 2001 Robert Weil, Kiedrich Gräfenberg Riesling Auslese, Rheingau is unctuous, mature, and racy. I tasted this straight from the bottle right before I left and wished I could have drunk more. Thanks to everyone for their generosity. I know I missed several other wines but it was purely by accident. Imported by Selection Massale. Batch RS14, Disgorged 21/11/17. A cranberry color. Fresh on the nose as if smelling from the vat. The cranberry juice aroma has hints of apple mulling spice. It eventually smells more like apple pie. In the mouth is piercing acidity, spiced flavors, and a very dry personality. Killer nose so the dryness is a bit of a surprise. Of strong personality but not for everyone. Drink now while the aromas are preserved. ***(*) Now. Imported by Wine Cellars. Alcohol 12%. A fine vein of bubbles, yet strong acidity and toast, with watering acidity. This is pleasantly chalky with a clean finish. A youthful vintage but is building ripe, bottle-aged flavors with good body. ***(*) Now – 2023. Finely scented. Strong acidity carries a mature, dry note. Very dry, clean, and light in fruit so opting more towards mineral. Fresh, capable of long life, and for my taste, in need of further age. ***(*) 2023-2038. Fine stuff! Biscuit on the nose with fresh, crisp mouthfeel, with bottle-age flavors. In mid-life. **** Now – 2028. Shipped by Allyn & Scott Wines. Imported by Wine Cellars. Alcohol 13%. The Don Stott Cellar. A light golden straw. Rounded body with flavors of green floral and tea convey the freshness of the bottle. A light to mid-weight wine it is supple with an old-school flavor and not quite leather finish. There is a gentle edge from nearly eight decades of age but in no way is this a challenge to drink. Holds up well in the glass. **** Now but will last. Imported by Milton S. Kronheim. Toast! Not Rated. Imported by Atherton Wine Imports. Alcohol 13%. A light straw color. Floral, greenhouse notes with some maturity. Very dry, tart and light with white fruit flavors on a razor edge. Elegant. *** Now – Whenever? A Rudi Wiest selection imported by Cellars International. Alcohol 8%. A maturing edge with sour white berries, focus, and a bit of lively acidity. Not too interesting. * Drink Up. Imported by MacArthur Liquors. Alcohol 12%. Zip in the start with textured, white fruit, lemons, and a tooty-fruity flavored finish. Not my favorite style. *** Now – 2028. A Rudi Wiest selection imported by Cellars International. Alcohol 7%. A medium straw color. Mid-weight with ripe yellow flavors that drape over the tongue. The lower acidity seemingly adds more weight to the yellow fruit. Good intensity of flavor but not the most verve. *** Now – 2028. Shipped by J & H Selbach. A Terry Theise Selection imported by Michael Skurnik Wines. Alcohol 7.5%. A medium yellow gold color. Lovely. Textured acidity exists with ripe fruit in energetic balance. There is supple, seductive weight. Richer than the subsequent bottle of Willi Schaefer. **** Now – 2038. Imported by Julienne Importing. Unctuous, not as lively as it is honied with hints of tea spice and suggestions of ripe tannins on the gum. It is flavorful with a developing tart, citrus note. ***(*) Now – 2032. Imported by MacArthur Liquors. Turning amber. Rounder and drier in the mouth with herbs, minerals, and honey. A long finish. ***(*) Now – 2032. A David Shiverick Selection. Imported by Langdon-Shiverick. Black tea mixes with weighty flavors and moderate acidity. There is a mineral vein. *** Now – 2023. Finely articulated acidity, sweet and soft, with just enough texture. The ripe fruit even takes on some stones. A good sweet wine. ***(*) Now – 2028. A David Shiverick Selection. Imported by Langdon-Shiverick. A similar flavor profile and density as the Fritz Haag. It is almost oily and racy which I like very much. ***(*) Now – 2028. Lars Carlberg Selection. Imported by Williams Corner Wine. Alcohol 7%. Very pale in color. An elegant, floral nose, delicate and fine. In the mouth delicate floral flavors. This is a clean wine with a fine acidic edge though slightly short in the finish. ***(*) Now – 2023. Imported by Premier Cru. Alcohol 8%. Unctuous and mature with a sweet tea note, racy vein, and quickly building complexity. Lovely. **** Now – 2038. Imported by MacArthur Liquors. Decanted into a metal jug which seems to have afflicted the wine. Not Rated. David Bloch returns from a hiatus in writing, though not tasting, to list his favorite Champagnes and both New and Old World white and red wines. At the end of October I was fortunate to attend an Italian tasting largely focused in on the wines of Bruno Giacosa and Giacomo Conterno. No tasting of Barolo should be without a mature example and this one began with a very fine 1967 Giacomo Conterno, Barolo. Double-decanted midday it continued to slowly develop in the glass. I can only write that I love the aroma and flavor of this type of wine. Also with attractive maturity, the 1978 Carlo Boffa & Figli, Barbaresco Riserva Vigna Vitalotti is meatier and earthier but leaves the impression of being tired. The youthful white-labeled pair of 1996 Bruno Giacosa, Barbaresco Gallina di Neive and 1997 Bruno Giacosa, Barbaresco Santo Stefano di Neive did not prepare me for the outstanding red-labels. At 20 years of age the 1996 Bruno Giacosa, Barbaresco Riserva Asili is beginning to move past its youthful stage. It is a powerful, intense wine which never takes away from the beautiful flavors. Younger in age and profile, the 2001 Bruno Giacosa, Barbaresco Riserva Rabaja promises a great future. There are primary aromas and flavors right now but everything is in place for slow development. Completely different in nature the 1997 Giacomo Conterno, Barolo Riserva Monfortino, with moderate concentration and complexity, acted as a segway to the outstanding 2000 Giacomo Conterno, Barolo Riserva Monfortino. This is a highly refined, ethereally flavored wine which fills the mouth. With air it fleshes out to provide seamless pleasure. What a tasting! Alcohol 13%. Looks like a copper-orange wine. There is a complex nose which is a touch maderized. In the mouth is focused, driven flavors that are quite lively and even sport some body but the wine is clearly not correct. Not Rated. Imported by Wilson Daniels. Alcohol 13.5%. The flint aromas make the nose stand out. In the mouth the precise, lemon fruit mixes with flint and smoke. 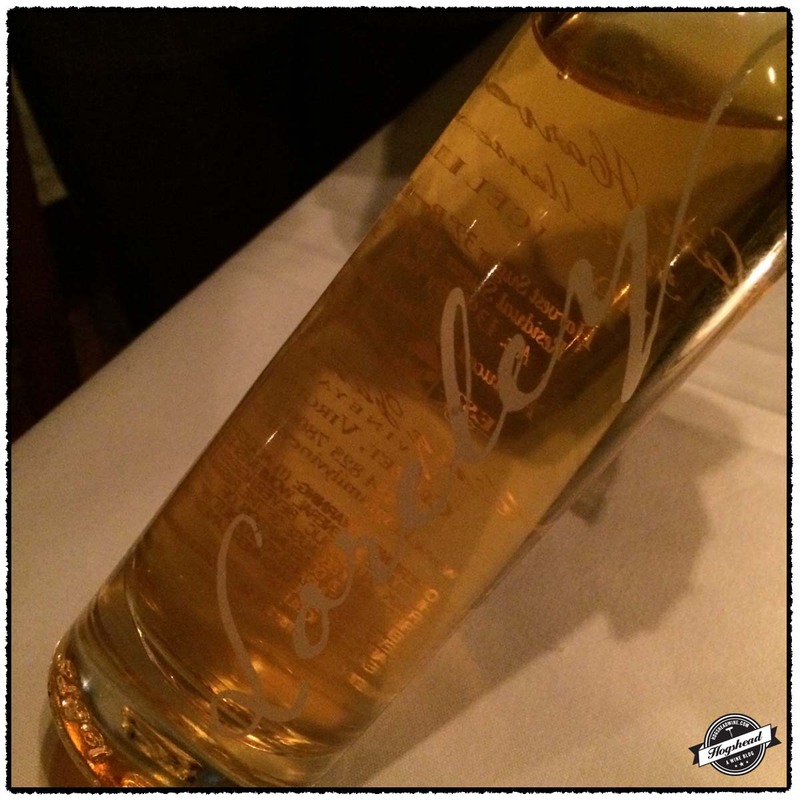 This is a persistent, tart wine with lime flavors and a long, finely textured finish. Impressive now. **** Now – 2026. A Becky Wasserman selection imported by Wine Cellars LTD. Alcohol 13.5%. The subtle nose is a touch earthy and lactic. A significantly rounder body is backed by glycerin. Flavors of lemon and lime take on subtle baking spices. It improves with air, filling the mouth with flavors and the sensation of an oily, luxurious body. ***(*) Now – 2021. Imported by Barrel One Selections. This is aromatic with sweet fruit and floral spices. The tart start is focused yet offers weight. It is almost puckering with a wood hint, floral flavors throughout, and smoke in the finish. It is almost spicy. **** Now – 2026. Imported by Vineyard Brands. A slight darker color hints at the inevitable. Shame! Imported by suitcase. The nose is subtly smokey. In the mouth are lively, fresh flavors that are initially linear and focused but expand by the finish. There is bottle aged complexity as this wine is beyond fruit. I like the blend of old leather and weighty, animale flavors that develop with air. ****(*) Now – 2026. Imported by The Rare Wine Co. The meaty nose is good and opens up a bit with air. In the mouth this is grippy with tart red fruit, and an animale nature. It builds subtle ripeness but is ultimately leaner and not as flavorful. *** Now. Imported by Winebow. Alcohol 14%. The fruitier nose is attractive with complex bitters-like aroma. This grippy wine starts with dry tannins and young fruit but it has very attractive grip, long taste, and a haunting personality. ***(*) Now-2031. Imported by Winebow. Alcohol 13.5%. The darker nose is more subtle. This is a rounder wine with less acidity and tannins, despite its youthful flavor. It shows more balance at this time. The complex red and black fruit are supported by some firm, underlying structure. ***(*) Now – 2026. Imported by Premier Cru. Alcohol 14%. The nose is concentrated and strong with fruity aromas of licorice. The rounded start is powerful with intense structure and fine, grippy tannins. The flavor, though, is undeniably beautify with density, and some bacon fat. The liquidity of the wine is bound with the acidity. ****(*) Now – 2031. Imported by MacArthur Liquors. Alcohol 14%. The flavors are of lighter berries and almost roast earth. The wine remains firm with fine, strong tannins. There is structure to last but the flavor concentration does not seem to be there. **** Now – 2026. Imported by Vieux Vins. Alcohol 14%. The young grapey nose makes way to a smooth entry of mouth filling, black, ethereal flavors. The power of this wine builds with time becoming fleshier too. Lovely and very classy. ****(*) Now – 2026. Imported by Kirkcrest Imports. Alcohol 7.5%. This, bright, electric wine is noticeable for its residual sugar and almost effervescent sensation on the tongue. The spices soon mix with sweet grapefruit and sugar. Young and a bit hard to drink at this stage. **** 2026-2046. Imported by Kirkcrest Imports. Alcohol 8.5%. Like liquid amber, this aromatic wine is lovely with an apricot hint that is more fresh than dried. It adds baking spices and cinnamon. Weighty with good integration of sweetness. **** Now – 2026. Jenn and I celebrated our latest wedding anniversary by spending a family weekend in Charlottesville, Virginia. The one person I happen to know there is Erin Barbour Scala (Thinking-Drinking). We previous met in New York City during her days as sommelier at Public NYC followed by The Musket Room. Having had diverse and fantastic wines with her before I knew there was no other choice than to dine at Fleurie restaurant where both she and her husband are now based. As Wine Director, Erin’s wine list focuses in on France and Virginia but she is far too curious to neglect the rest of the world as was evidenced by her selections that night. We were greeted to glasses of NV Rolet, Crement de Jura for ourselves and locally made sparkling grape juice for our daughter. The Rolet was great by itself, accessible with a nice balance of yeast and fruit. It left me thirsty for more wine. I select the wines we drink at home on a daily basis so it is nice to step away from making any choices. We gave no direction to Erin as to what we felt like drinking or avoiding. With Coravin in hand Erin proceeded to pour a utterly fun variety of wines. To go with our shrimp risotto with carrots and shellfish sauce she poured the 2009 Domaine Jean-Marc Pillot, Chassagne-Montrachet Les Chaumes. It was utterly satisfying and drank spot-on with its balance of maturity, fruit, and supportive toast. Jenn’s herb crusted halibut was joined by the 2010 Schäfer-Fröhlich, Bockenauer Felseneck, Riesling trocken Grosses Gewächs, Nahe. The glass was incredibly and persistently aromatic with herbs, stones, and some petrol with great balance in the mouth. Great stuff! For my venison Erin poured two different red wines. The 2011 Avennia, Sestina, Columbia Valley is a Cabernet Sauvignon, Merlot, and Cabernet Franc blend with fruit sourced from the Bacchus and Red Willow vineyards. It was forward and complex with darker, racy fruit that was hard to resist. Avennia was only launched in 2010 so if this second vintage is an example of their other wines this is a new name to follow. My second red wine was completely different being the 2010 Cambridge Road, Dovetail, Martinborough. As Erin pointed out this field blend of mostly Pinot Noir with Syrah is not such an oddity given the affinity for these varieties to perform in cooler climates. Its oscillation between Pinot Noir and Syrah aromas was rather intriguing. With our trio of desserts and petit fours came the King Family Vineyards, Loreley, Monticello. This pure Petit Manseng wine was made in the vin de paille style. She poured this wine because it shares the same name as our daughter. It was a touching end to our meal. 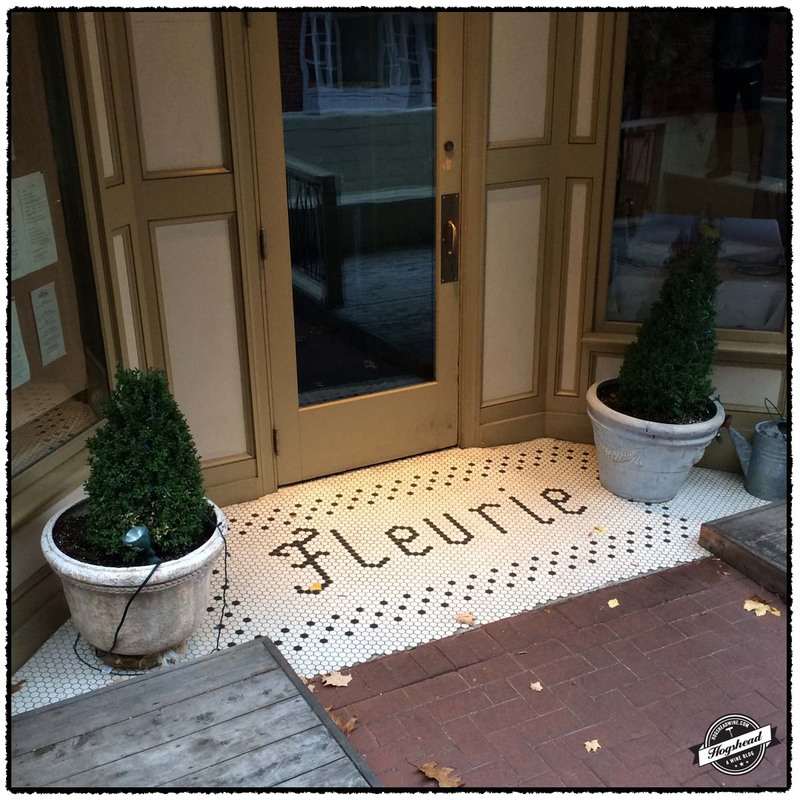 If you are in the Charlottesville area or need a break from the city I strongly recommend you dine at Fleurie. Due to the Coravin you can drink almost anything on the list by the glass. With a large order of wines soon to be added there will be even more reasons to stop by. This past Sunday afternoon Lou and I gathered in his tasting room just outside of his wine cellar. There was no particular theme for the afternoon but I did think the mini-flight of 2002 Auslese would be good fun for him. So I brown bagged those three half-bottles. 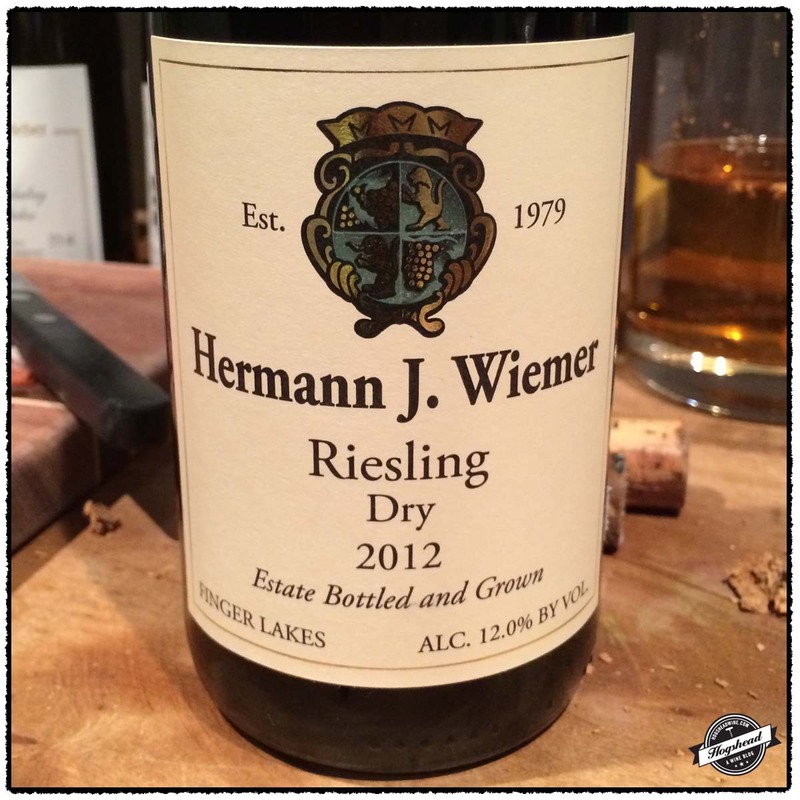 We started with the 2012 Hermann, J. Wiemer, Riesling Dry to acclimate our palates. Lou had recently enjoyed a glass while dining out so a bottle naturally found its way into his cellar. This was a well-made distinctive Riesling. 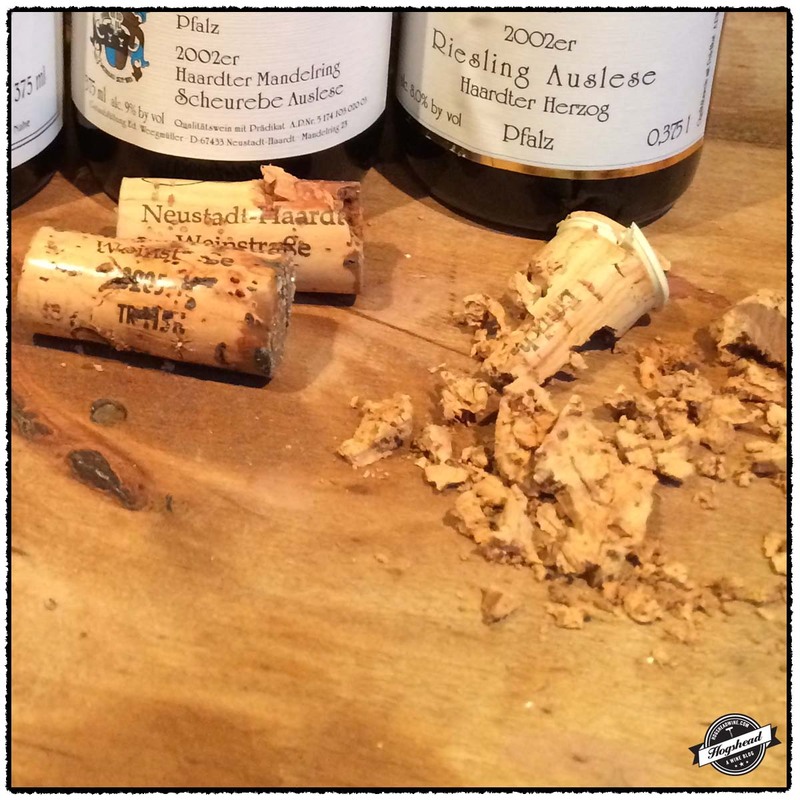 I lost the battle drawing the cork from the 2002 Emrich-Schönleber, Monzinger Halenberg, Riesling Auslese. I had to dig it out with the screw and after clearing a passage for the wine a large chunk of cork remained impossibly bonded to the inside of the neck, it had never budged despite my heavy-handed approach. The wine itself was full of cider flavor showing old notes beyond full maturity that were a little off-putting for me. Much better and in retrospect clearly Scheurebe (or should I write not Riesling) was the 2002 Weingut Ed. Weegmüller, Haardter Mandelring, Scheurebe Auslese. Lively, viscous, complex, and still on the upslope. Definitely worth buying. 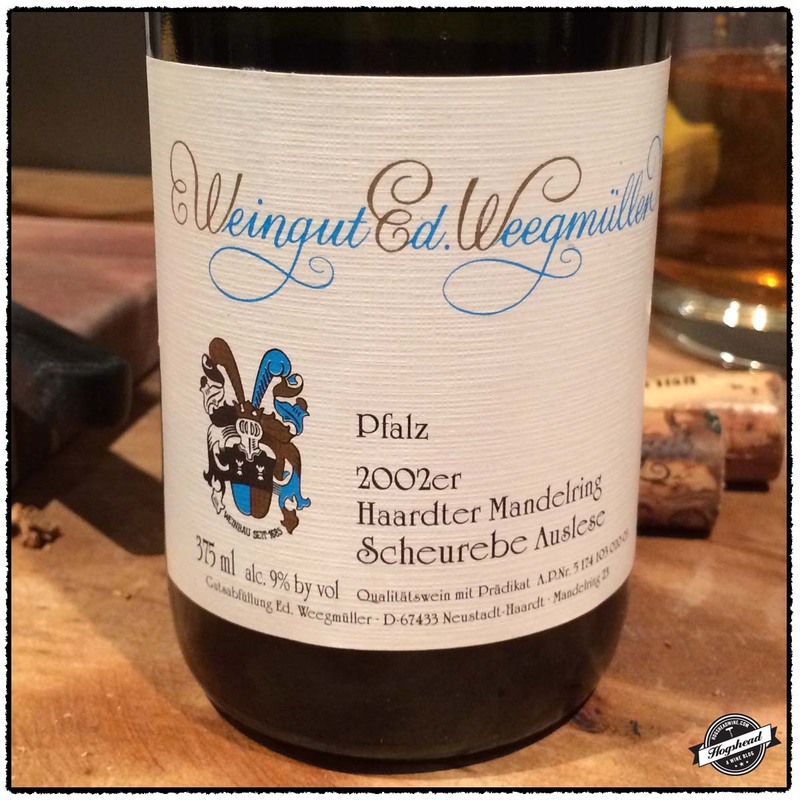 The 2002 Weingut Ed. Weegmüller, Haardter Herzog, Riesling Auslese was really good too. There was a tension between youth and maturity with Lou particularly liking the tart finish. This was less overt the the Scheurebe, taking more time to open up and actually drank well on the second night. Our switch to red wine was foiled by a badly corked half-bottle of 1998 Brigaldara, Amarone dell Valpolicella Classico. Shame. Fortunately the 2005 Pax, Syrah, Castelli-Knight Ranch was coming into its own in the decanter. It always sported a great nose but at first the flavors were a touch austere but this perfectly matched the black fruit and drying tannins. Jenn and I tried it again several hours later when it had come together by taking on a little flesh and a racy quality. I think this should be cellared more. What I particularly liked about all of the wines we tried is that they each presented aromas and flavors I do not encounter on a daily basis. Curious wines for a Sunday afternoon! This wine is 100% Riesling. Alcohol 12%. There was moderate, lively ripeness to the flavors with notes of stones. Clearly new world it remained lively on the tongue. There were chalk notes and a refreshing aftertaste. On its own the touch of sweetness to the fruit is evident as well as grapefruit notes. ** Now-2015. Imported by Chapin Cellars. Alcohol 9.5%. The color was a medium amber. The nose bore older aromas, cider, and hints of plain oldness. In the mouth there were definite flavors of apple cider. Due to less viscosity and residual sugar the acidity showed better. Rather advanced and not too exciting. * Now. Imported by Terry Theise. Alcohol 9%. The color was a medium to dark lively yellow. There was a good nose of peach and nectarine with fresh aromas. In the mouth were stone fruits marmalade, viscosity, and some grip. The acidity was balanced and integrated. Towards the finish the wine became fresh with levity, complexity and gentleness. On the second night there was a bit more apricot note, good weight, and a touch of salty flavor. This is drinking well nose. **** Now-2024. Imported by Terry Theise. Alcohol 8%. This was amber in color and actually the darkness. There was a very aromatic nose of marmalade. In the mouth there was brighter acidity, a little wood note, and mature flavors. It still had some freshness of youth. There was some residual sugar with good viscosity. It was tart in the finish with a tangy aftertaste. A nice wine. **** Now-2020. Alcohol 14.9%. There was a good nose with fresh smoke aromas. The wine had a salty entry with pencil lead mixing with black fruit and drying tannins. It was a little austere at first but I thought this matched the black fruit and tannins. There was a core of dried herbs and a little liquor heat in the finish. With air the stones and watering acidity was matched by more flesh and a racy component. ***(*) Now-2020.